The Days of Johann, an agility dog! : First corneal implant in dog performed in the US! First corneal implant in dog performed in the US! Sinisa Grozdanic an assistant professor of Veterinary Clinical Sciences performed the surgery that restored sight to 7-year-old Dixie, a Mountain Cur breed owned by Brett Williams of Runnells. "We are excited for Dixie," said Grozdanic. "She was our patient for such a long time and nothing really worked. She was gradually going down visually and we were finally able to do something to definitely improve her quality of life." "She is my pet and my friend," said Williams. "She is the best dog I've ever had. Even when she was almost blind, she was still my best dog." Dixie, who had gained weight due to inactivity from her blindness, has lost seven pounds since the surgery. "She used to walk right behind me when we'd go for a walk. She couldn't see and was scared," said Williams. "Now she wants to run ahead." Dixie's sight was restored through a two-step surgical procedure that involves cutting into the eye to take out the cloudy cornea and inserting a permanent, plastic cornea. The new cornea is sutured, or stitched, into place. The entire eye including the new, plastic cornea is then covered with tissue from the dog to help the eye heal from the surgery. 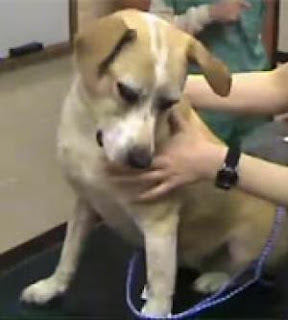 Because of the tissue and the bandages, the dog cannot see after this procedure.